2011 TRACK: No more updates are being made to this page - goto 2011 TRACK (link on left). Alumni Christmas Eve Run: Some brave soles toed the line to tackle this course on Christmas Eve morn. 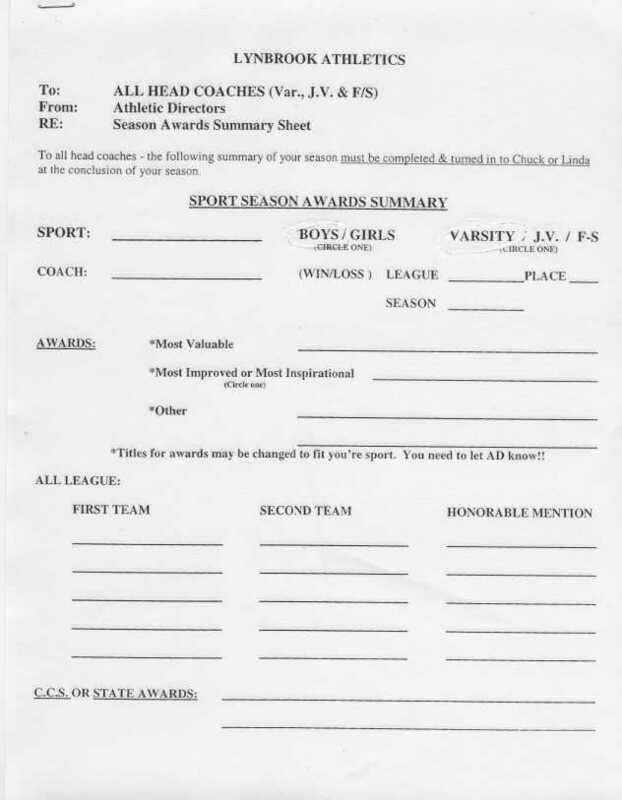 VG CCS Scholastic Award: Lady Vikes had the highest team GPA, click link on left for announcement. 1982 Millrose HS Mile (indoor): Los Altos coach Charles Alexander moves into 2nd with two laps remaining and finishes 4th. XC Dual Meet/Invite Results generator (11-27-10): Meet Directors, tired of taking hours to generate your meet results after a cluster meet? I've created an Excel file (using a Macro written in VB) that makes creating results less time consuming (I actually use it to time/score League Meets). Ctrl-S is the command that does the calculations. The link to the left is the Excel file (be sure to say YES to enable Macros and read the INSTRUCTIONS tab to see how it works) and this link (WBAL Results) is what it can generate for you. If you have any questions or suggestions on how to improve it, let me know at HANKLAW@IX.NETCOM.COM - enjoy. Jump & Sprints Coach: The Harker School is looking for an assistant track coach for sprints and jumps with an emphasis on jumps. If you are interested please contact Paul at paulnangle@gmail.com. 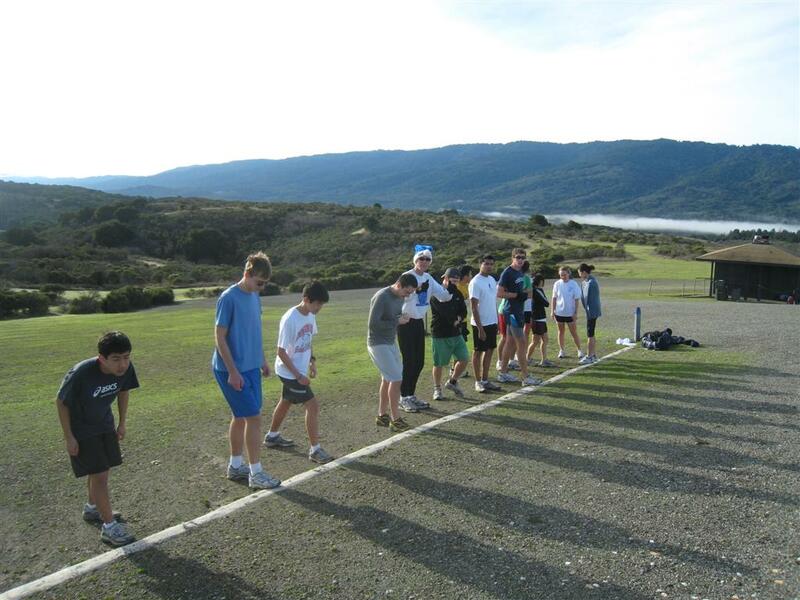 3rd NorCal Distance Clinic: Is set for Jan 8th at Crystal Springs Uplands School. Sprint & Jumps Coach: Henry M. Gunn High School is looking for two assistant coaches for Track and Field 2011. A jumps coach and a sprint coach. A stipend will be provided for each position. Please contact Matthew A. Tompkins at matthew.tompkins@tka.org for more information. The position begins in late Jan. and ends in May. Head Track Coach: Woodside HS seeks a Head Boys and Girls Track Coach. Woodside boys won PAL and girls tied for second in PAL in 2010. First place finishes at Stanford and Arcadia in 2010. XC Coaching position also open. Paid stipend position. If interested, please contact Athletic Director Wendy Porter at wporter@seq.org soon. CCS By-Laws: *New* out of season practice guidelines - Section 4-A (starts at bottom of page 5). Where coaches can work with a group of 4 athletes on skills, twice a week for 1 hour each session. Lynbrook Course Records: Updated with 2010 marks added. Throws Coach: Burlingame High School needs a men's and women's throws coach for the 2011 Track Season. Small stipend available. Please contact Megan Fish at meganfish@gmail.com. 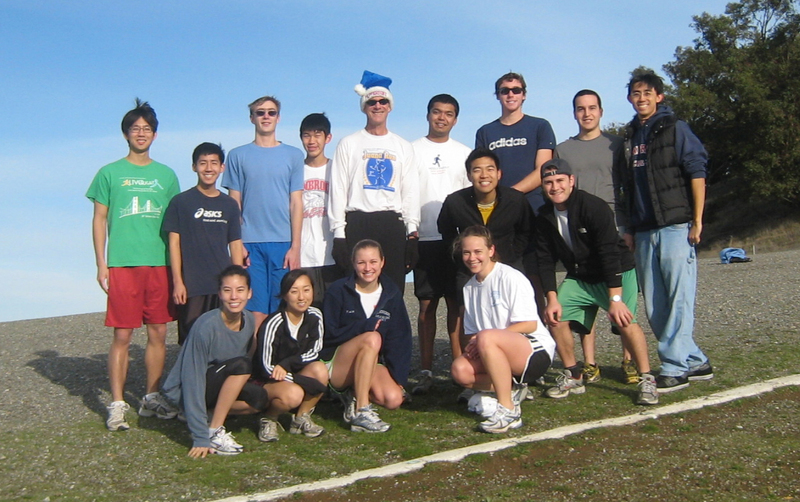 2011 Track Clinics: Lots of 'em - in Jan & Feb. Throws Coach: Archbishop Mitty HS is seeking a throws coach for both men and women for the 2011 track season. All interested should contact Kevin Dunn (kdunn@mitty.com) or Dina Oakland (doakland@mitty.com). Throws Clinic: Nov 28th from 9-4 at SJCC Track. Lynbrook XC: End of Year Party - check here for details. Preventative Officiating (from Hal Harkness): Check out item #3 because I REALLY like this. Can all officials do this for the kids? It would be great if they did. LA XC meet NOT cancelled due to heat: 97 degrees - now that is hot! NFHS Track & XC Rule changes: Good to review since XC is getting ready to start. Be aware that this jewelery rule does not take effect until Jan 1, 2011 so for the 2010 XC season, jewelery results in an automatic DQ. I have checked this with Hal Harkness. Rule Changes article. Rule Changes Summaries. Jewelry Rule: More clarification on this rule and the direction it's going is great. In brief, a team gets a warning before any DQs might take place. Jewelry is still illegal. Also, unadorned devices, such as bobby pins, barrettes and hair clips, no longer than two inches, may be worn to control a competitor's hair. This rule was updated to reflect common practice in some states and achieve consistency throughout the rule's application. These items for hair control are not considered dangerous for the contestant and are not considered jewelry or adornment. WCC Finals: CCS is well represented at the WCC Finals. Tyree Johnson (Palma), Luca Signore (Lynbrook), Weston Strum (Pioneer), Greg Innes (SI), Marcos Hinojosa (Bellarmine), Ganbileg Bor (Jefferson), Matt Bejar (Bellarmine) - not pictured, Erik Anderson (Bellarmine & Antonio Venegas (N Salinas). Meet Pictures. Valley Christian HS: is looking for a throws and hurdles coach for the 2011 track season. If interested, please contact Tammie Marshall at tmarshall@vcs.net. Stanford Reunion: 1st row: Eric Mastalir (Crystal Springs Team Record), Ceci St. Geme (Hopp), Alison Wiley, Anne Locke: 2nd row: Ryan Stoll, Pat Fox, Charles Alexander ('81 Kinney Natl Champ), Mark Mastalir (Crystal Springs Team Record): absent: Jeff Atkinson, Marc Olesen, Ellen Lyons (Crystal Springs Record holder). 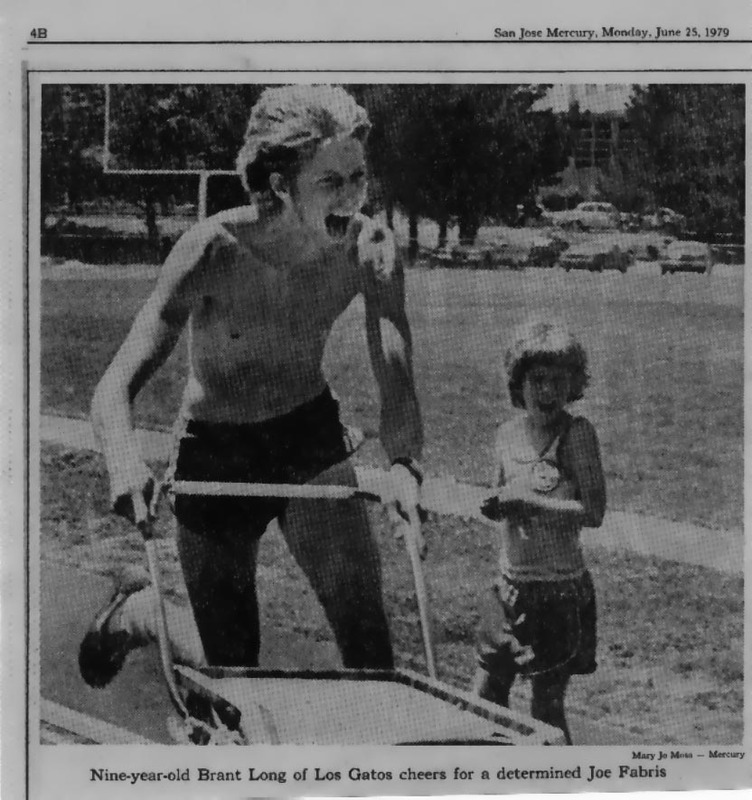 1977 CCS XC Finals: A 2:00 video (ignore the first 23 seconds of a track race) where Bob Love (Carlmont) wins. Note the congestion of the race at the top of Cardiac Hill. Shoreline XC: Unofficial results for the Shoreline Open XC Meet. Baylands 5K: Lynbrook gets closer to Wilcox in the Varsity Boys loosing by only 2 points. Lady Vikes take the win. Octoberfest 5K: Campbell holds their 3rd annual 5K with 400 registered runners. BATC Clinic: Bay Area Track Club is putting on a clinic at Gunn HS (Go Titans!) on Oct 30th. SCVAL AD Minutes: There was an emergency meeting of the SCVAL AD's on Sept 27th to discuss XC. Lynbrook Pasta Feed: Night before Crystal some major carbo loading was being done. Inspirational: As I always tell my runners, "Don't tell me what you can't do, tell me what you can do." Central Park Invite: VB's beat out Milpitas on the 6th man tiebreaker while VG take 2nd behind a very tough Los Gatos squad. Meet Pix Here. Coach Dennis DeHart (MP): Coach DeHart was at Mt Pleasant for 36 years and coached some of the MP running greats of the 60's, 70's & 80's passed away last week. His Memorial Service brought many of these greats back together again (but who are all the OLD guys?). Can you find a CCS Champion, a sub-4:00 miler, a current CCS Record holder and many others? Mt View XC Coach: Tough season for Mt View as they loose their second coach of the year. Saratoga Invite: Girls nab 2nd behind a tough Saratoga team while Boys take 3rd. Varsity #2 also comes away with a 2nd (with a very nice 26 second spread for their Top 5) while JVG take 6th. Meet Pix Here. Rallye Run: Team of Richard, Clarence, Andrew, Alex & David ran away with the win in the Annual Rallye Run. A tie for second with 25 points each went to the tie-breaker and David, Spenser, Max & Chap-Long got the not over Angela, Jessica, Ksenia, Hun, Chole & Salnan. Memorial Video (1:32:59): Rick Milam Memorial Service (video link on the left). Memorial program. The memorial service for Rick Milam was held in the Los Gatos High School gymnasium on Sunday, September 19. The gymnasium was nearly filled to capacity. Tony Nunes, who was Rick's employer at NBN Sports, welcomed everyone. Mike Dudley, co-meet director of Los Gatos meets; Willie Harmatz (-24:37), who hosted the CCS Top 8 meet for 32 years with Rick; and Rick's older brother Leroy Milam (25:55-) gave their remembrances. 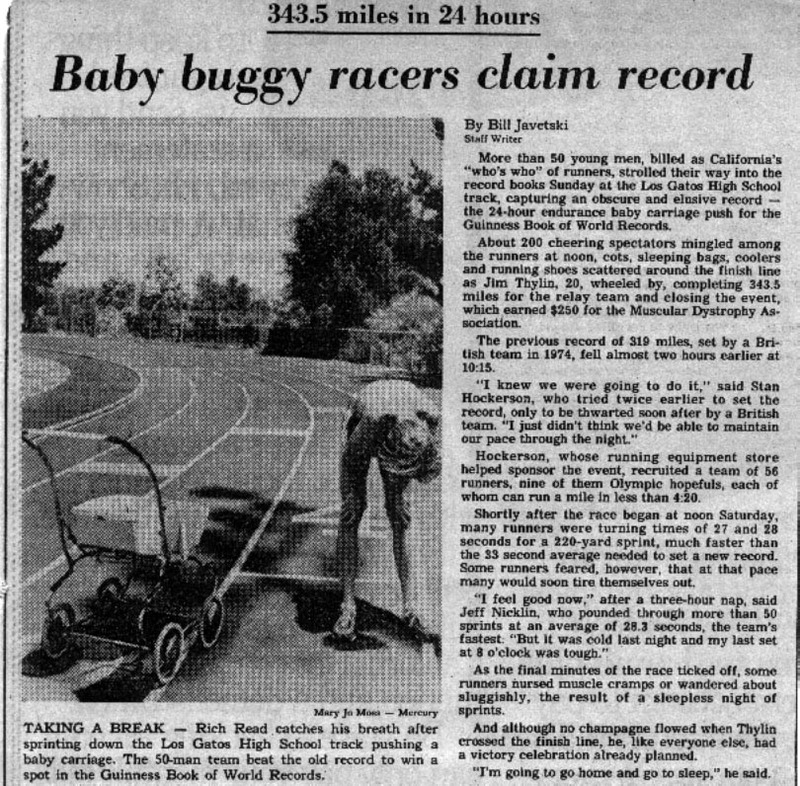 25:17- Don Bowden, American's first sub-four minute miler, was introduced by Tony. FireBird/Eagle Meet: Varsity Girls & Open Boys claim victories while history is made on the Los Altos HS campus with their first ever XC meet. Meet Pix Here. Mt Pleasant XC: Bummer news for the sport of Cross-Country, Mt Pleasant HS will not be fielding a Cross-Country team for the 2010 season. We Didn't Start the Fire: The Aragon coach sent me this and I like Billy Joel - amazing what you can find on the Net. Rick Milam - INFO(8/26@11:00am): More info on Rick and his memorial can be found on the link to the left. On Sunday morning (Aug 22nd) Rick was in a car accident due to a heart attack just before the crash. He was taken to ICU at Valley Medical for over 25 hours. Everything was done but it was not enough. Rick passed at 8:30 pm on Monday (Aug 23rd). Memorial Services are now set for Sunday, September 19th, 2:00pm-4:00pm, at the Los Gatos High School Gymnasium. Article by Mark Foyer of Half Moon Bay Review. There will be time for an "Open Mic'. Our only request is that you keep it between one and two minutes maximum. San Jose Mercury obituary. Lynbrook Center Meet: Varsity Boys & Girls both take 3rds. FSG win their division. Hans Templeman (Carlmont '71): Just who is this guy? Del Mar Dons XC Invite: Del Mar is hosting a MIDDLE SCHOOL XC Invite on Oct 15 - tell any Middle School coaches you know about this new event. Brains Need Downtime, too: SJ Mercury article on being too connected all the time. "At the University of Michigan, a study found that people learned significantly better after a walk in nature than after a walk in a dense urban environment, suggesting that processing a barrage of information leaves people fatigued". Montgomery Hill All-Time List: Thanks to Kevin Liao (Evergreen alum) for keeping this up-to-date. First day pictures: More shots from the beginning of XC season. LA84 XC Coaching Manual: I went to a clinic (08/21) at MtSAC put on by the LA84 Foundation and the link to the left is something they gave to all attendees - nice reading/review for new and old coaches alike. I will be posting presenters PowerPoints as I get them. SCVAL Pre-season meeting: Coaches, our pre-season SCVAL XC meeting will be held on Thursday, 9/2/10, at 5:30PM in the teacher's lounge, which is right off the front parking lot, at Wilcox high school. If anyone has suggested agenda items in addition to the normal items, please let me know. Also, if any coach receiving this e-mail is not presently a coach at their former school, please forward this e-mail to the new coach. Frank Biehl e-mail: From Steve Nelson (Mt Pleasant): After 24 years at Mt Pleasant I have been replaced due to transfers of other teachers and my lack of seniority. It appears that I will end up at Evergreen, although I would like to stay at MP. If you contact Mr Biehl (email on the left) to encourage him to find a way to keep me at MP, I would appreciate it. Crystal Springs Schedule: Check it out to see who is running when on the Crystal course. Update#3: You can smell it in the air - XC Season! 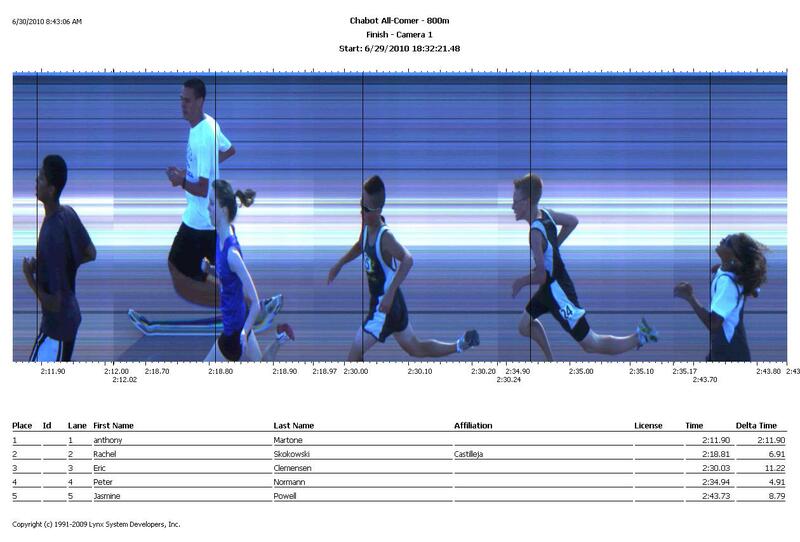 Results of LGAC's: The Los Gatos Summer All-Comer Meets. Results 08-05. Some LGAC pictures. Guinness World Record: 24 hour push to set a record. Joe Fabris. Update#2: Only 6 weeks until the start of XC, are you running yet? CCS Preview: Boys & Girls: Cross-Country Express posts what Josh Small (Valley Christian) thinks what the pre-season rankings are for the upcoming XC Season. 26 page document: on how to set up a local web-server at a Track Meet so results are available on your iPhone. Chabot JC: has All-Comer meets on Tuesday & Thursday nights. Link on the left are the 800 results. Check out their web site for more info. Crystal Spings Uplands HS: is seeking an assistant cross country coach for the upcoming 2010 season. Applicant needs to be available during the season from late August through the state meet on November, 27th. Full coaching stipend is available. CSUS is located on the border of the city of San Mateo in Hillsborough. Season schedule and team website can be found at www.eteamz.com/csuxc. If interested, please contact athletic director Michael Flynn at mflynn@csus.org or call (650) 375-5424. Christopher HS (Gilroy): Head Cross Country Coach & Head Track Coach needed. Stipend positions. New member of the MBL. New school in its second year. Grades 9-11 only. Anyone interested can contact Athletic Director Darren Yafai. Darren.Yafai@gusd.k12.ca.us 408-843-4123. Gilroy HS: Head Track Coach & Horizontal Jumps Coach needed.Stipend position available. Member of TCAL. Host site for TCAL Track Championships, host site for Avis Kelley Track Invitational, host site of 2007-2010 CCS Track Championships. Full staff in place except for jumps. 2010 TCAL Girls Track Champions, Boys 4th in CCS in 2010. Boys CCS Champion 4x100 relay team and boys CCS 200m Champion returning. Anyone interested can contact Athletic director Jack Daley. Jack.Daley@gusd.k12.ca.us 408-848-7178. Los Gatos HS: track team is in need of a Throws/Weight coach for the 2011 season. Please contact Kirk Mansfield at 408 655 1845 or Willie Harmatz at 408 206 9973. CCS XC At-Large Times: Click here for the CCS at-large times for this year. XCStats 2010: More features than ever: 26 reports, training logs, team management tools and, in the spring, track! And coaches don�t need to load results. They are offering a nearly-free trial for new subscribers. BACAA Corporate Regionals: Team SCVAL won the 33rd Annual Corporate Regionals today at Los Gatos HS. Next stop, Nationals on July 24&25 in San Ramon. Summer Running pix: Summer Running has begun for the Vikings and anyone else that wants to join in. They've been getting about 20 in the morning and a dozen in the afternoon - come on by for a run. Gunn HS: is looking for an assistant cross country coach for this upcoming season. Stipend available. If interested, please contact Ernie Lee (ernest_lee@sbcglobal.net) for more information. Lynbrook Viking DATES: Lynbrook Parents Meeting-Sept 2nd, Lynbrook Picture Day-Sept 23rd. History of Division breakdowns: State Meet break downs as remembered by Ernie & Walt. San Jose Mercury News: Track Athletes of the Year. SCVAL Track Post season minutes: SCVAL Coaches, if you weren't there then you should read these minutes. Also some UNOFFICIAL minutes from the CCS Post Track season meeting. Evergreen Valley Girls XC Coach: Evergreen Valley XC Coach: Head Varsity Girls Cross Country Coach Opening at Evergreen Valley High School (San Jose). Full district stipends available. Contact Athletic Director Lisa Baker 347-7029, bakerl@esuhsd.org and also apply on edjoin.org. Interviews will start immediately. 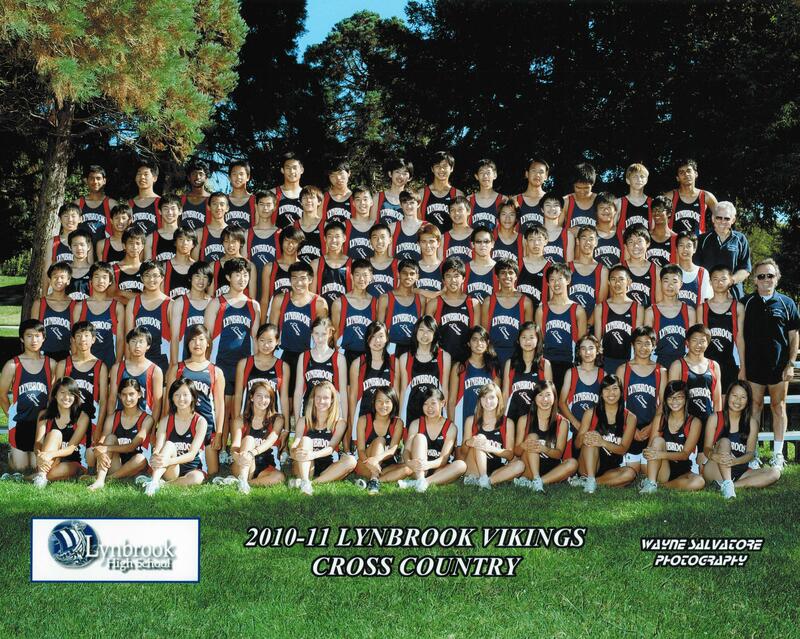 Update#1: Lynbrook XC and Summer Running. CCS Top 100: Congratulations to the following 88 individuals/teams that made it on to the CCS Top 100 All-Time list. Top 100 updates have been completed (still working on 4x1, 100/110H, 100 & 200). SCVAL Ruling: Senior Boys are not allowed to compete in the JV Division at SCVAL League Finals - In case you were wondering what has been going on, scroll down to the bottom of the link. Join Yahoo Group: Dear Cross Country Parents and Students, I'd like to invite you to join the Yahoo! Group SCVAL-X-Country. The purpose of this group is to promote communication and discussion for the sport of cross country here in the Santa Clara Valley Athletic League. The group is free to join and will only take you a few minutes. You can join now by clicking on the following link: http://sports.groups.yahoo.com/group/scval-x-country/ There are important decisions being made in January regarding the participation rules for next season. In particular, these decisions will effect all current Juniors (rising Seniors). I encourage you to join now and become informed about the issues being discussed. Regards, Ed Sesek Parent of a MVHS Cross Country runner. St Ignatius High School: is seeking a head boys' cross country coach. Fall practices begin August 13. Stipend begins at $3,049 for the season. This is strictly a coaching position, no full-time teaching position is available at this time. For further details, go to www.siprep.org/athletics/documents/BoysCrossCountry.pdf. Contact Bob Vergara, Athletic Director, at rvergara@siprep.org. Fox Athletics: Is once again having their Summer Track Camp. Dons Track Camp: The Del Mar Don's are hosting a summer track camp. Palma High School: Head CC coach at Palma HS and Distance coach for the Palma Track team...both are paid stipened positions. Please contact Jason Smith 831 970 1128 or Steve Clayton AD at 831 422 8510. Second summer camp for jumpers: (5 days a week) starting June 15: the place is Bellarmine and the time is from 4pm-7pm. HJ days are Monday- Wednesday-Friday, LJ and TJ are Tuesday-Thursday. Cost for 6 weeks, that's right, 6 weeks!! ( 350.00 make check out to Bellarmine). Any question email at coachjumps@yahoo.com or phone (408) 394-1991. Valley Christian High School: is looking for a throws and hurdles coach for the 2011 track season. If interested, please contact Tammie Marshall at tmarshall@vcs.net. North Monterey County High School: in Castroville, CA has openings with stipends for the position(s) of Head Cross Country Coach and/or Head Track and Field Coach for the upcoming school year. There are also teaching positions available at the school including Science, Social Studies (Geography), and ELD (The ELD position could also be a Spanish position if needed). 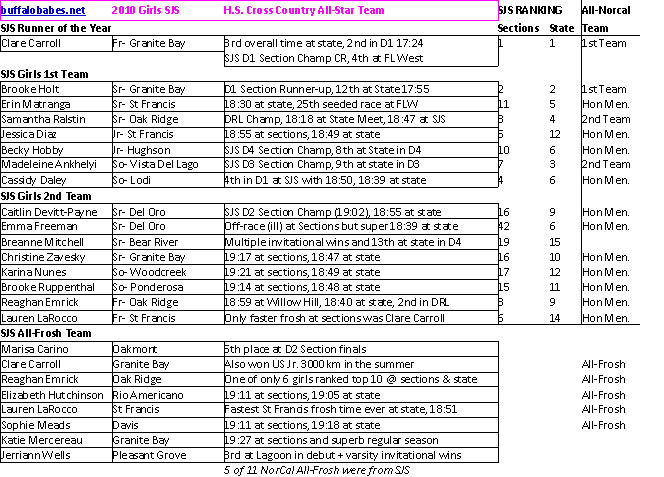 The North Monterey County Cross Country and Track teams have a great tradition of excellence within the Monterey Bay League and the Central Coast Section with numerous league and section titles as well as a runner-up finish at the state championships. The cross country team also hosts the incredibly successful Earlybird Invitational each year. The teams have many capable assistants (including the outgoing head coach) to work under the new head coach. Feel free to visit the school, district, and/or team websites for more information. Team website http://nmcxc.tripod.com/ School website http://nmchs.com/ District website http://www.nmcusd.org/ If you would like more information, please contact outgoing head coach Gustavo Ibarra at gusibarra@netscape.net 831-524-1283 and/or Athletic Director Roger O�Sullivan rosulli@comcast.net 831-596-2727. Wilcox Head Track Coach: Opening for Head Boys and Girls Track and Field Coach for the 2011 Season Full staff of assistant coaches in place. Contact Athletic Director Woody Freitas: wfreitas@scusd.net. Presentation Head Track Coach: Presentation is seeking a head coach for our women�s Track & Field program. 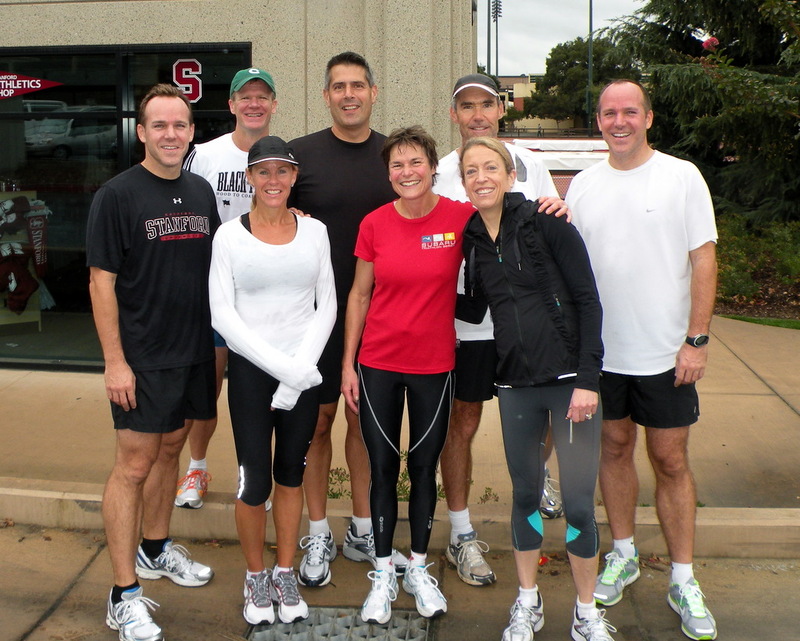 Cupertino Pride: Another local running club for the summer. XC Dual Meet Results generator (updated version on its way): Meet Directors, tired of taking hours to generate your meet results after a cluster meet? I've created an Excel file (using a Macro written in VB) that makes creating results less time consuming (I actually use it to time/score League Meets). Ctrl-S is the command that does the calculations. The link to the left is the Excel file (be sure to say YES to enable Macros and read the INSTRUCTIONS tab to see how it works) and this link (Partial WBAL Results) is what it can generate for you. If you have any questions or suggestions on how to improve it, let me know at HANKLAW@IX.NETCOM.COM - enjoy. 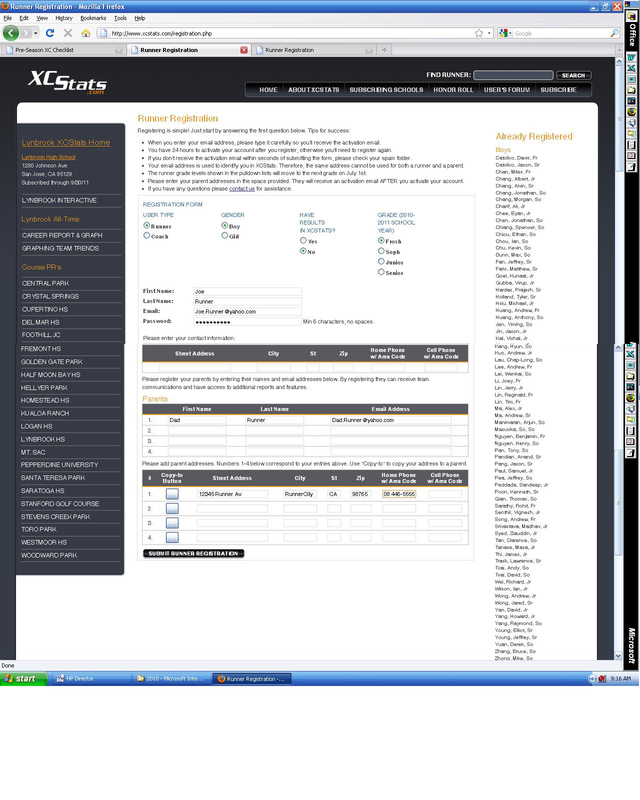 XCStats 2010: is loaded with new features this year. A brief update should be posted by 5/21. Check it out. Fremont XC Coach: Fremont High looking for a Varsity X-C coach Fall of 2010 if interested please contact Jason Townsend at 408-522-2431 or jason_townsend@fuhsd.org. Monta Vista XC Coach: Head Coach Openings at Monta Vista High School (Cupertino): Head Cross Country and/or Head Track and Field (distance) Coaches needed. Full district stipends available. Contact Asst. Principal (Athletics) Michael Hicks if interested (michael_hicks@fuhsd.org). Interviews will start ASAP. Silver Bullets Track Club: Got plans for the summer? Wanna run? Check out the Silver Bullets. Bellarmine & WCAL XC History: Jack Callon has done a wonderful job putting together a Terry Ward history of Bellarmine XC with WCAL results going back to the 60's. 2010 Track: Still looking for 2010 Track results (GWI, NON,...).